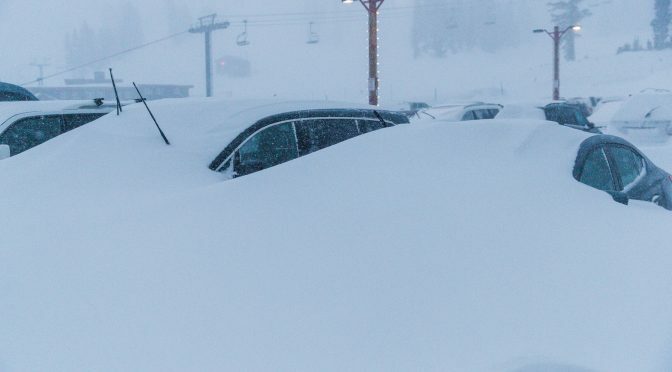 Lake Tahoe, CA/NV – An incredible amount of moisture is pouring into the West Coast off the Pacific Ocean this week, leaving remarkable amounts of snow at Sierra Nevada ski resorts. Up to seven feet of new snow has been reported at some resorts thus far, and forecasters are calling for additional accumulations of more than three to five feet heading into next week. In total, forecasts call for 25-30 inches of water equivalent at Mammoth Mountain from this storm cycle over the next 10 days. Although long-range forecasts should always be taken with a grain of salt, snow totals approaching 20 feet over the next 10 days are possible, especially at higher elevations. Mt. Rose Ski Tahoe has measured over six feet of new snow from this storm cycle. Even at lower elevations, Homewood Mountain Resort on the shores of Lake Tahoe has received over seven feet of new snow this week, with 18 inches falling overnight last night at the summit, and 28 inches in a 24-hour period.